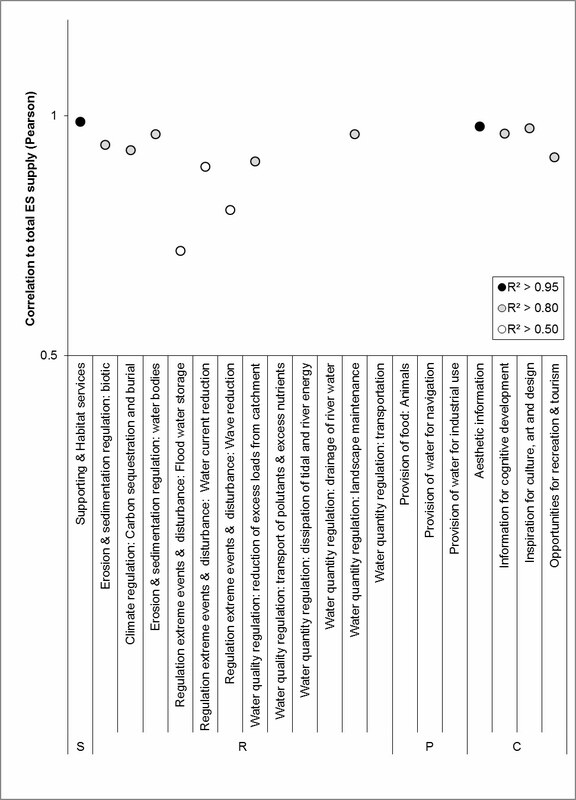 An assessment of ecosystem services in function of (estuarine) management can assist in the comparison of several development scenarios regarding efficiency, sustainability and equity. For a broad set of 38 selected TIDE measures, an explorative ES analysis was therefore performed to assess potential impact of the measures on ecosystem service supply. The separate results of this screening can be found in (see report “Managemen t measure analysis and comparison”). It provides an immediate snapshot of expected increase or decrease in ES supplies by the different measures. Additionally, knowing that potential interactions (see section 7) between ecosystem services take place (see sections 5.2, 5.4, 7) and measures differ in their expected impact on several ES (for detailed examples, see report “Management measure analysis and comparison”), it is important to verify which ecosystem services supplies actually increase together and how this relates to the total supply. Therefore, we took the results from the measure-ES assessments and verified correlations between separate ES supply shifts and the total summed supply shift per measure (Figure 39, n=38). This correlation demonstrates that supporting / habitat service (“biodiversity”) increases have the highest significant correlations with the increase of total bundle supply, followed by aesthetic information and a selection of regulating and cultural services. This suggest that estuarine measures aimed at restoring or developing habitat / supporting services effectively yield high ecosystem service benefits and are highly synergetic. From all other correlations, none were significant within these selection of measures, which indicates effective trade-offs persist. The absence of significant negative correlations between increased service supply within the measures reflects the selection of the 38 measures, which mostly consisted in biodiversity and regulating service targeted measures and less in direct provisioning service increasing measures. Figure 39: correlation between separate service supply shift with total summed supply shift. Based on 38 estuarine management measures (see report “Management m easure analysis and comparison”).